DESCRIPTION: Used for attaching flashing, terminations or insulation to parapet walls and masonry block. Also used for nailing lumber to concrete and masonry. Heat Treated steel, also known as hardened steel, survives strong hammer blows. Lengths from 3/4 to 8 inches. 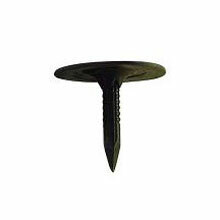 Spriral Shank, Ring Shank, Fluted.